Ask fellow campers about "Ohiopyle State Park" and nearby attractions. This is a very nice state park with the typical no-frills amenities. However, it is near Ohiopyle with a lot of hiking, waterfalls and river rafting activities nearby. We camped here during the week after Labor Day and it was it was only sparsely filled, which made it VERY quiet and relaxing. We arrived and no one was at the main office because of training. We self registered and went to our site. Most of the sites are well shaded within forested areas and very spacious. The showers were typical for state parks but were clean and serviceable with plenty of hot water. The restrooms were clean. The RV sites were electric only but several water filling locations on way into park. Dump station was easy to access on the way out of the park. Entrance roads are a little steep and hilly. I would stay here again. We camped at Ohiopyle State Park in a Motorhome. Lovely wooded campground with decent space between most sites - I stayed at #159, with two tents, and a tarp over the picnic table - truck parked above, parallel along the road, but close. Site is not level, but we managed to stay dry over two nights of downpours, and the creek behind the site drowns out the noise from the generator (?) building on its other sides - stay away from sites between 159 and the nearest bathhouse if you like quiet. Trails [some unmarked] link to campground road for easy hiking to area's striking waterfalls. Park is quiet, clean, and well maintained. Roads in are a steep grade. Firewood and ice for sale 24-hours at camp entrance. Cafe in town has excellent sandwiches. 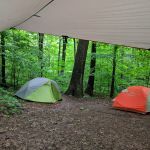 We camped at Ohiopyle State Park in a Tent. Ohiopyle Cafe! The BLT is super. Campground is set deep into the park. Long winding access road. Steep at the beginning. Campground is nice with sites set fairly close together and somewhat level. Pets are restricted to certain loops. Bathhouse facilities very nice and modern. Tons of hiking, great whitewater rafting, canoeing and kayaking. Possible to get potable water on way in to park at main bathhouse. Dump station also accessible on way in and out of park. We camped at Ohiopyle State Park in a Travel Trailer. The town of Ohiopyle is small but used to tourists. Has restaurants and outdoor gear shops. Area is really big on whitewater rafting and kayaking. Lots of hiking trails, too. No nearby supermarkets. There are 200 campsites, about 56 RV sites with 20, 30 &/or 50 amp service. No sites have water. One bathroom has a spigot on the outside. Service is very good and friendly. The park is in deep deciduous forest. Near Frank Lloyd Wright's FALLING WATER and KENTUCK KNOB homes. Youghioheny River sings over rapids - yes, rafting! Great Allegheny Passage walk/hike/bike trail runs through park. So much to do, so little time. Great park - our 28' coach had tons of room in site 195. We camped at Ohiopyle State Park in a Motorhome. We were given directions to the Giant Market - best in area. There's a good laundromat in Uniontown as well, Express Wash. However many days you plan to stay here, plan to stay a few more. This is a simply beautiful park with spacious campsites, many of which are pet friendly. There are many hiking trails, and access to the Great Allegheny Rail Trail for bicycling directly from the campground. Nearby Ohiopyle has more great hiking, biking, and river activities. We camped at Ohiopyle State Park in a Motorhome. The site we stayed on was electric-only, and water hookups were not available nearby, so come with a full tank. Firewood available on site. Follow the campground's direction to avoid a 9% grade hill between Ohiopyle and the campsites. The hill inside the campground is also very steep. Use low gear. This is a large campground with some electric only sites and many are not level. We picked a level site (140), the only level site out of the 30+ choices we were given, so be careful when making reservations. The other thing to watch for is that there are only a percentage of sites that allow pets. Showers were okay, except that the shower heads were only five feet high! I kept hitting my head on it and had to get under it to wash my hair. When we left the next day, the potable water was right next to the dump station and leaked so badly that no water actually filled our tank. We alerted a park employee that this was very unsafe due to possible contamination of the potable water supply and he said he'd make a note of it and drove away. We found another water spigot at the bathhouse up the road (most spigots in this park do not have a hose end on them so you can hook up your hose). Verizon signal was good, no chance of satellite at most sites since they are heavily wooded. We camped at Ohiopyle State Park in a Motorhome. This is a busy state park, you need to fill you water tanks and dump you waste tanks as most state parks offer. This is our 2nd time here and its shady and muddy in places as most state parks. The one thing to know is the park is on a mountain top and it a haul up a steep paved road to get to park then drive a couple miles in. Our motor home had no issue driving in towing out truck, but others need to be aware that its a good mile straight up. Ohiopyle with all the activities are down along the river back down the mountain. We love it here. Some of the best food and things to do here. We enjoy it. White water rafting at all levels. We camped at Ohiopyle State Park in a Motorhome. Campground has lots of potential, but is not being maintained by the state of PA. Foliage is not being trimmed on the very narrow roads in the loops resulting in damage to vehicles. Voltage was suboptimal in most 30 amp sites. Bathhouses are old and in a state of disrepair. There are no water hookups at each site. Most water spigots located in the loops were broken. Quiet hours were not enforced by the camp hosts. Upon check-in, a young employee was less than cordial and treated us as if we had inconvenienced him by arriving. One of the worst state park stays we've ever had. The lack of maintenance is a shame as the property is beautiful and has much potential. We camped at Ohiopyle State Park in a Travel Trailer. This is another great state park. We went there to visit Falling Water which is close by. Then we discovered we could go to the 9/11 Memorial only about an hour away. Also discovered many other things to do in the area which we didn't have time to take in. Park is quite remote and a little difficult to access, but well worth the effort. We didn't heed to warning about the one route which is very steep and not recommended, so be warned - it IS steep. Also, as is many time the case with state parks, it is dry camping, but we did have 50 amp service - surprise! We camped at Ohiopyle State Park in a Fifth Wheel. The Ohiopyle State Park campground is one of the bigger campgrounds in the PA State Park system by number of sites. Nearly all sites are wooded. The park itself is great. This review does not factor in the park. It is a good hike from the campground to the action in the park by the river. The problem is that the sites typically are rather close together with very little buffer between you and the next site. There are also not enough shower buildings to support the number of sites. The bath house cleaning and maintenance is average. The campground map from the web site makes the campground seem larger than it is. Again, the sites are very close together. The most direct road from the center of the park and the town is very steep. RVs should heed the warnings and take the alternate route. As for non-electric sites, Aspen road loop sites are very compressed with the neighbors as are Fir loop. Birch Rd sites are nicer, but no nearby rest room. Elm Rd loop is OK and has a restroom without showers (site 65 best on this loop). Juniper Rd sites seemed pretty good with one of the better shower houses. Electric sites don't have as many choices. I wouldn't want to move a large rig through this campground without calling for site information first. Pet sites are limited to Hickory Rd and Ivy Rd and a small number of others. 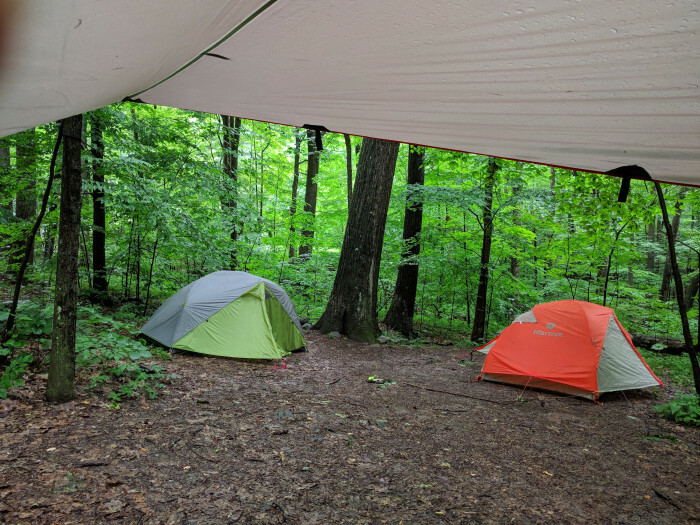 We camped at Ohiopyle State Park in a Tent. This park is gorgeous...the campground is too, but...it needs work. First off, a camp host who is present and doing his job. The day we arrived, our fire pit was loaded with broken bottles and aluminum cans. It also had other plastic garbage making it quite unsightly. Our 50 amp did not work, but we can function on 30. Park has garbage strewn here and there. This would not be problem if you had a decent camp host who cared a little. Too bad. Bathrooms were not the cleanest and definitely need to be updated, but had plenty of hot water with good pressure. Sites are not level, so plan accordingly. The park itself makes up for it. Great hiking and biking. Lots of beautiful waterfalls and vistas. We would probably come back in hopes we were victims to a lazy camp host and that conditions would improve. We camped at Ohiopyle State Park in a Fifth Wheel. If you are looking for a good night's rest in a very quiet campground, this is the place for you. If you are like most campers and want to enjoy an evening by a fire with good conversation then steer clear of this place. We camped here in a 5th wheel with friends in the next site over. There are several reasons why we won't come back. First there is not one level site in the over 200 sites they have, secondly the bathrooms although are cleaned daily are in dire need of renovations. The only saving grace is the abundant hot water and excellent water pressure from the showers, other than that this is not what I consider to be decent. Lastly and most importantly the reason we won't be returning is the stalking park rangers. Yes, I said stalking. The second evening camping these rangers came walking through our site and went directly next door to our friend's campsite. We watched as they swept through their site and came over to find our friends to tell them to shut off their radio. Granted quiet hours starts at 9pm but that radio could not even be heard from the next site over (which happened to be ours). Later that evening the same rangers were hiding in the pitch dark on the service road listening to my husband's conversation with his friends. The came up and were told that they are not allowed to talk outside and that they needed to go inside. Every evening afterward, we witnessed these rangers hiding in empty sites with their lights turned off almost like they are waiting for someone to break a rule. I felt uneasy the rest of our stay, not because I was breaking any rule, but because of that creepy feeling I had that someone was watching me in the dark woods. Be forewarned! If this wasn't good enough for you, just go talk to locals because this is common knowledge in town. We camped at Ohiopyle State Park in a Fifth Wheel. Nice state park close to Kentuck Knob, Fallingwater and all the recreation activities of the Laurel Highlands. Bathrooms and showers clean with a tub sink available. Sites are not always level. Plan accordingly. Anyone interested in not putting extra strain on their vehicle if towing or a larger rig would be best to enter/exit from US 40 in Chalk Hill, PA. The road from PA 381, while short, is quite steep, as in first gear, foot-close-to-floor steep. Rate reflects senior, out-of-state, off-season, electric. Would stay here again. We camped at Ohiopyle State Park in a Travel Trailer. I have camped at this campground for the past 5 years and each year I have always wanted to stay an extra week because it was so nice. This year however I noticed deteriorating playground equipment on several of the small playgrounds throughout the park. Many of the picnic tables needed to be repaired or replaced. Also, several fire pits were broken and unusable for cooking. The men’s bathroom showers on our loop had tiles that were missing or loose. Also, there was no hot water in the woman’s restroom deep sink. During the week it was very peaceful and relaxing, with other campers adhering to park rules. However, during the weekend we had some noisy neighbors who were checking in late, well past the quiet hours that are from 9 pm to 8 am. They made unnecessary noise while setting up camp. Even though the park rangers came and spoke to them to ask them to quiet down, the rangers made it seem that the campers should be expected to make such noise while setting up, even at 11:30 pm. We will definitely camp in a different loop next time to see if that makes a difference. We camped at Ohiopyle State Park in a Tent Trailer. This is a very nice park. Sites are available for everything from tents to larger RVs. There are plenty of trails, including the Allegheny Passage rail trail. I would rank it higher than 7 if the sites were more level, and if they would enforce the quiet time hours. We tried to go to sleep at 11pm listening to people in party mode. Also was awakened at 6:30am by screaming children on bicycles and someone driving in tent stakes. Quite time is 9pm to 8am. We may go there again, but only on weekdays. Be prepared for a lot of going up and down hill to get to this park. If you have a larger rig, pay attention to the alternate route on the web site. We camped at Ohiopyle State Park in a Fifth Wheel. Are you affiliated with Ohiopyle State Park ?